I'm not sure whether rugby will ever truly be a globally competitive game however it is always thrilling to see the game growing in 'minnow' nations. Having watched a fascinating documentary on Madagascan rugby, and witnessed the obvious passion displayed, I sincerely trust that SARU, as custodians of the continent's strongest rugby nation, are doing their bit to help expand the game northwards. The game I saw was played in Antananarivo, between Madagascar and Ivory Coast, in front of a full-house 40 000 screaming spectators and it was a wonderful display. 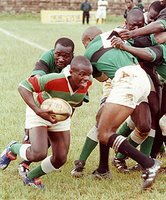 For a long time rugby in Africa was managed, coached and administered by foreigners - men and sometimes women with a passion for the country they found themselves in and a selfless devotion to the sport. Over the past few years, however, that framework has begun to change and new steps are being introduced to allow Africa's rugby to follow a more self-taught and self-helping path. Jean-Luc Barthes is IRB Regional Development Manager for the French-speaking countries of Africa and therefore the man charged with managing this change. "The way things worked in the past brought a certain amount of success, but often saw the people from the countries themselves given secondary responsibilities and made to watch from the sidelines. "Things are different today. There are less French ex-pats running projects and more people from the countries wanting to help develop and run the sports themselves, they just lack the experience and skills they need to do it. "That's where this project is aimed, to help those people gain the core competencies and experiences to allow them to teach others in turn, and more importantly to teach others how to teach." Barthes' European IRB colleagues Micheal Arpaillange and Pierre Villepreux have also worked on Africa’s new model for change and are now applying it to the developing countries of Europe, starting with a workshop in Toulouse this week. The project model, whether applied in Africa, Europe or any of the other regions, aims to implant a central point of acumen and organisation for the wider management of best practice, or business process. The first crucial stage for Barthes and his colleagues is to find the right person to spearhead development in each country. "The right person will have the profile, the desire and ability to take charge of the development," says Barthes. "Normally, and hopefully, they will go on to become the country's National Technical Director." The training itself is geared around three key criteria, which are used to measure progress and ultimate qualify the candidates. 2005 saw the start of the programme in Africa, with one qualified representative from each of 16 countries (see below) invited to begin a course that they will attend again in 2006 and 2007. "2005 was a great success - each union came up with a development plan for 2006, which we will go on to evaluate this year and use to help plan ahead for 2007 and beyond," said Barthes. "The training modules are well designed and should give them the grounding they need. For example, how to put together a four-year plan, how to properly manage a project, how to develop rugby in schools, how to develop Sevens. "It's very important to have all of these countries, as wonderfully different as they are, doing these core things in the same way. 2006 should see even more activity. Three more workshops will be held in November and December and contact has been established with three additional countries – the Congo, Central Africa and Gabon - with a view to them joining the programme. "The ideal supplement to the work we are already doing would be to send specialists from the more developed countries such as Tunisia, Morocco, Ivory Coast, Senegal and Madgascar to the likes of Mali, Niger, Tchad and Togo among others to help take training and coaching practices forward, but that is more for the future." Oh, in the match I saw the Ivorian's had the definite physical advantage with their big, bulky players. The Madagascans are generally slight but, boy, they were quick and being driven on by a fanatical crowd. The game was ultra tense and went right down to the wire with the superior pace and fitness of the home side eventually granting them a 30-10 victory to much exultation from the crowd. Come on SA - get to work in Nigeria, Ghana, Kenya and Tanzania.